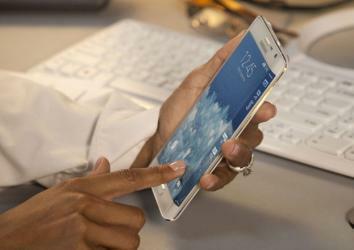 Samsung Galaxy Note Edge is weird, interesting, bad for lefties. The Note Edge may be the first smartphone whose screen abruptly turns a corner. Long gone are the days when Samsung simply copied Apple’s smartphone blueprints. The Korean electronics giant’s foray into quirky territory of its own began with the launch of its oversized Galaxy Note three years ago. And it continued on Wednesday with the announcement of several new devices, including the latest versions of the Galaxy Note—one of which is among the odder smartphones yet released by a major player in the industry. 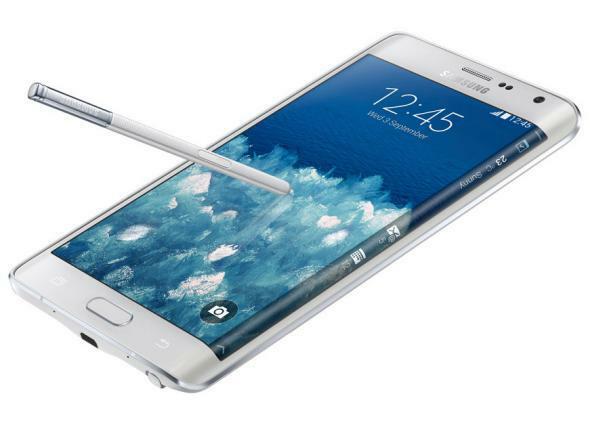 That would be the Galaxy Note Edge. In most ways it’s a clone of the Galaxy Note 4, which was also unveiled Wednesday, with one major difference: Its screen turns a corner. The smartphone industry has been buzzing about curved glass for years now, but the Note Edge puts it to use in a novel way. Most of the screen is flat, but the right-hand edge slopes abruptly downward at an angle, creating a sort of tall, skinny, second screen which Samsung calls the Edge Panel. It’s not simply an extension of the main screen. Instead, as Fast Company’s Harry McCracken observes in his hands-on first look at the device, the angled panel has a range of special uses. It can be a quick-launch toolbar for your favorite apps. It can display Android notification and incoming calls without covering up what you’re doing on the main screen. It can function as a toolbar within specific apps, including the native camera app. Turn the phone on its side, and the angled edge can even serve as your bedside clock. Samsung has a history of adding pointless features to its phones just because it can, and perhaps the angled edge will turn out to be just another gimmick. The Verge’s David Pierce said it quickly became clear when he tried the phone that the idea “isn’t necessarily fully formed.” Conservative buyers who like their smartphones huge will probably opt for the regular Galaxy Note 4, which looks like a straightforward successor to the Note 3. Works great if you’re a rightie! That may go double for lefties, who are likely to have a hard time even reaching the Edge Panel when holding the phone with one hand. Even a two-handed grip might prove awkward for southpaws, since holding the phone with one’s right hand while touching the buttons with the left will obscure a significant portion of the panel. It’s equally unclear whether consumers will have much interest in the other new offerings Samsung trotted out on Wednesday. These include yet another Samsung Gear smartwatch and a Gear VR virtual-reality headset made in partnership with recent Facebook acquisition Oculus. The Galaxy Note 4 will be available in the United States next month on AT&T, Verizon, T-Mobile, Sprint, and U.S. Cellular. The Note Edge is scheduled to come later this fall. Samsung’s try-anything, see-what-sticks strategy results in a lot of misses, and I wouldn’t want to be among the people who drops hundreds of dollars on a failed experiment. Still, the approach has its merits in an industry that has long been led by Apple, a company built on the exact opposite philosophy. Apple only releases things it is absolutely convinced consumers will like. Samsung releases pretty much whatever it pleases, and if consumers don’t like it, well then, it tries again. As Business Insider’s Steve Kovach pointed out, the Gear S is Samsung’s sixth(!) smartwatch in just the past year. They’re bound to get it right eventually, aren’t they?